Forfar West End: Christopher Hutchison, Craig Logan, Martin Black, Daniel Millar, Graeme Gibb, Grant Lawson, Mark Pirie, Kevin Garrick, Bryan Duell, Stewart McConnachie, Darryl McKenzie. Subs – Gary Muckersie, Scott Johnston, Darren Cox, Craig Johnston, John Roberts, Sean McVicar. The game went ahead after a morning inspection following heavy rain throughout the week. Penicuik were forced into changes after Gray, Milne, Cole and Gay pulled out in the morning meaning that the recently injured Noon and Barr took up places on the bench. Forfar’s first choice goalkeeper Vanderdyl was replaced by Hutchison as the home side looked to consolidate their position at the top of the table. Penicuik kicked off into a low sun but Bald distinguished himself with an early save before Pirie blasted a golden opportunity wide when he was clean through on goal. 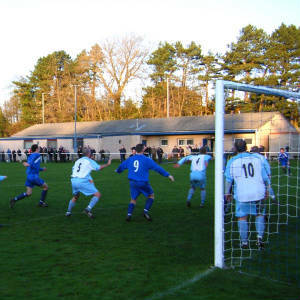 Penicuik replied with a couple of corner kicks before producing their best chance so far. Coleman running in on goal failed to connect properly with a Montgomery cross and only managed to weakly side foot the ball past the post. In the twenty fifth minute Darren Moonie outstripped the home defence but Hutchison managed to block the striker’s effort and Kelly put the rebound past the wrong side of the post. Penicuik continued on the offensive and a Coleman cross just glanced off Moonie’s head when he was well placed in front of goal. Forfar almost took the lead when Lynch missed his tackle allowing Garrick to send Pirie through with only Bald to beat. Bald did well to deflect Pirie’s effort away for a fruitless corner. Another Lawson corner kick put Penicuik under pressure and Walker conceded a free kick on the edge of the penalty area which again came to nothing. In a quick Penicuik break, Harvey sent Moonie clear of the defence but he appeared to stumble and knock the ball harmlessly on to a relieved Hutchison who gathered comfortably. Forfar came straight back and Garrick’s powerful shot was deflected past the goal. From the corner, McKenzie’s angled effort across the face of goal went out for a bye kick. With thirty five minutes gone another Lawson corner kick was headed wide by McKenzie. Three minutes later Penicuik had a goal chalked off for offside much to the anger of the visiting fans. Montgomery running from deep headed a Harvey lob past Hutchison only to see the offside flag raised on the far away side. With three minutes to go to half time the opening goal came at the other end. Harvey was almost through for Penicuik but was stopped by a last ditch tackle which both conceded a corner and injured Harvey in the process. Hutchison cleanly held Gallagher’s corner kick and he immediately punted the ball the length of the field. Penicuik’s defence missed the ball completely and BRIAN DUELL ran in to give Bald no chance and his side a priceless half time lead. Harvey was unable to resume after the interval through injury and was replaced by Noon who has been out injured since his last appearance on 12th September against Kinnoull. Forfar kicked off and won a corner in the first fifteen seconds of the second half as the home team looked for a decisive second goal. Penicuik looked as if they were still in shock over losing the goal so close to half time and were struggling to contain an eager home side. With three minutes gone McConnachie found an unmarked Duell but his left foot shot hit the outside of the post and went harmlessly out of play. One minute later, the visiting supporters were once again up in arms with the match official. Centre half Craig Meikle got his foot out to intercept a through pass and goalkeeper Billy Bald pounced to pick up the loose ball. The referee decided that the ball had been deliberately kicked to the goalkeeper and awarded an indirect free kick just outside the six yard box. The powerfully struck shot deflected off the Penicuik team massed on the goal line and in the ensuing scramble a free kick was given to Penicuik when the ball hit McConnachie’s arm. Steel went down with an injury before another West End corner came to nothing. Penicuik survived the onslaught and almost caught the home side napping in the 55th minute. Dean Walker miskicked on the edge of the penalty area but when the ball fell at his left foot his snap shot curled past the post. Coleman was booked for delaying the restart at a Forfar free kick as the midfield battle raged. With twenty five minutes gone substitute Scott Johnson was introduced by Forfar and soon afterwards, Barr also returning from injury replaced Coleman for Penicuik. The visitors were now gaining control of the play and came close to equalising in the seventy sixth minute. A Barr pass released Montgomery on the left and from his cross, Moonie’s header was hooked clear. Noon curled the rebound across the face of goals and out for a bye kick. With less than ten minutes to go, goal scorer Duell was replaced by Muckersie as Forfar were defending deeper and deeper to hold on to their one goal lead. Referee Graham stopped the game when Montgomery was in possession to book Muckersie for dissent with the Penicuik players upset that their forward momentum was halted. Barr skied the resultant indirect free kick high over the cross bar. In the forty first minute Montgomery who was causing all sorts of problems for the home defence almost skipped clear but his shot was deflected for a corner. A sign of the pressure Forfar were under came as Penicuik lined up to take the corner kick. An argument developed between Forfar’s Logan and Garrick which quickly turned into fisticuffs before referee Graham red carded both players for head butting. With a two man advantage Penicuik kept up the pressure but centre half Gibb who had been outstanding all afternoon really came into his own and cleared anything Penicuik could throw at the Forfar defence. Kelly headed past from another Montgomery cross and then Kelly shot weakly straight into Hutchison’s arms. With everybody camped in the Forfar half, Hutchison’s kick out set Muckersie free but much to the anger of the home support who claimed he had picked the ball up in his own half, the far side linesman flagged for off side. At this point even the home spectators were kicking the ball away when it went out of play. Despite the additional three and a half minutes, Penicuik could not come up with the equalising goal and get any reward for their spirited display.